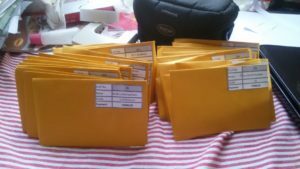 3rd stage, money and many, many files | Felix Doll – Patenkinder Matara e.V. Unfortunately my second stay here in Sri Lanka already will finish soon. Just two and a half weeks remain here. At this time, however, we still have a lot to do. Enough of the little future here. Back to the past (the real reason of this blog). My free Sunday was more or less free. The program included the writing of some reports for applications and applications for universities. This turned out to be difficult, because I could not print and save the registration documents, so my mother had to support me at home. But then it worked so synonymous. Actually, I wanted to go to the family in the afternoon, like the last weeks before. After it was already dark and I was a little bit tired, I buried this plan and gone into my bed very early. In the following days there were several things. After the transfer of the money failed in the week before, since we could not withdraw the money, the surrender was made on the Friday of this week. The problem of withdrawal was that the limit for withdrawal of my bank cards was overpinned by the high withdrawals. So the money was on the account, but we did not get it. Already in the weeks before we had always to fight with this problem. For contacting the bank, only with difficulty, I needed my mother for it again L J . Unfortunately, the problem could not be solved by phone, so I had to wait until my mother returned to Karlsruhe on Tuesday to personally contact the bank (after a few car problems 😉 it lasted until Wednesday until she could contact the bank). On Wednesday night the problem was solved, so the remaining 200,000 rupees were finally lifted. Therefore, on Thursday, the relevant students were informed and the handover on Friday finally determined. On Saturday, Tesheema and Govindi had already started re-sorting the students‘ files. A new system of order was introduced. The files were given colors, according to their classes, and received their corresponding number on the back of the file. This of course facilitates the order of the files. 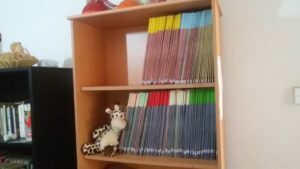 In the adjoining room of the Waitingroom (my office) are three shelves, in which both the books of the library and the files of the students are stored. The order of this, however, has now become quite forgotten, which is why the books are arranged rather scattered. Now one of the shelves was completely cleared and from now on only serves the files (and presently my assistant 😉 ). For this, the corresponding space for the books in the other shelves was of course free. These have to be reorganized in the next two weeks. However, since many of the books are unfortunately missing, we have to re-acquire some books beforehand. The order can then be redesigned. These were our works until Thursday. On Friday, as already mentioned, the surrender for the funds was charged. Therefore, the pupils gathered around the small hall in the afternoon. Reverent Vipassi was also not present this time. After some greetings from Miss Kanthi, the funds were handed over. Because of the short notice, of course, a few students were missing. When they receive the money, we will see. With the handover, with the exception of the missing students, we finished the 3rd stage. For me it this also means, that my work about the victims of the flood is finished now. Both following this surrender, as well as already with the surrender before, I was thanked by a lot of pupils or parents. I would like to take this opportunity, to give this thank to the two chairmen of the scholarship, Reverent Vipassi Thero, the two secretaries, local volunteers, the individual sponsors, and most especially those who are followed the call for supporting affected Students and Families with donations (please sorry for if somebody else specially also should be in my list which isn´t now). Exceptionally, the next day, no classes took place, since „Poyaday“ was a holiday. So I had once again free. I was invited by the English teacher, Mrs. Rathna, to go to lunch. The house of the family is also in Nawimana, not at the town, so I had to look how to get there. My questions to my friends if the bus would come in spite of the holiday wasn´t answered before I had to start there. The man of the guest house said the bus would come, so I gone to the bus stop and waited there for a while whether a bus would come (some buses drove and also several people except me were waiting for a corresponding bus). I do not know whether my real bus was driving, because after a short but violent rain show, a man from the village stopped in front of me with a motorbike to protect himself from the rain. If someone remembers my reports of the first stay, I had been invited by a family to a kind of „funeral feast“. The father of this family took me with him now. Unfortunately, I could not remember his name (even after almost six months which I have spent here now, the local names still nearly impossible for me to remember straight). So I was practically brought to the house of Mrs. Rathna. It was a nice afternoon I stayed there. In the meantime, I received the news from the guys that they were going to take a small trip in the afternoon, so I was picked up at about four-thirty with TukTuk and we went to a nearby temple to visit. For the reason why the temple was closed, I unfortunately did not know, and the Sinhala shield, which hung at the barrier in front of the street, of course I could not decipher. Instead of visiting the temple, there was a further trip to the beach. Everything in the next report.